Rising monolithically from the abyssal plain of the Indian Ocean, far away from the homely shallows of the Sunda Shelf and more than 1600 km from Singapore, is the coconut definitive's remotest outpost. And, as if celebrating its unlikely membership of the fraternity of coconut stamps, it bears the same name in latin: Cocos. The journey that brought the coconut stamps to the Cocos Islands began more than three centuries earlier, when Captain William Keeling of the British East India Company discovered the coral atoll on his way home to England. Human settlement arrived in about 1826, when two British merchants brought their native workers from the Malay Archipelago. One of them was John Clunies-Ross, who started a business harvesting and exporting coconut meat. He was the first in a five-generation fiefdom that would see the illustrious tenure of the coconut definitive on the sun-soaked oceanic idyll a hundred years later. The great naturalist Charles Darwin's assistant Syms Covington, who visited with his master in 1836, noted in his journal that "the islands are complete forests of cocoa nut trees". Darwin himself marvelled at how "utterly insignificant" the Great Pyramids of Egypt were in the shadow of the gigantic coral reef lurking beneath the waves. A map made by James Holman FRS in 1840. According to a pilot chart published by the United States Naval Oceanographic Office in 1969, the 8000-kilometre great circle from the Cape of Good Hope to the Sunda Strait passes through the Cocos islands. 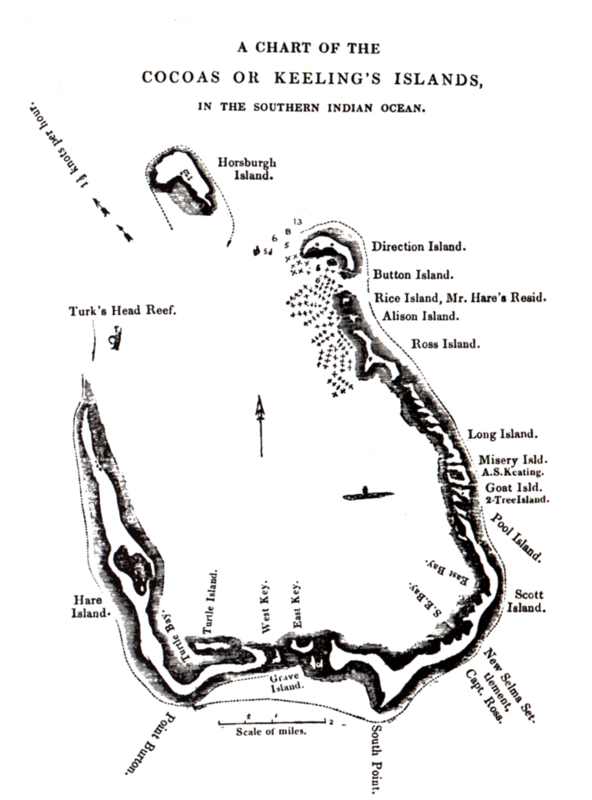 The islands were such an important landmark in the open sea that they were marked even in small-scale maps covering the whole of the Indian Ocean. In the decades before air mail, the most reliable way to send letters from the Cocos Islands was via the famous 'tin can' mail service. Outgoing mail was enclosed in a four-gallon drum that was carried out from the lagoon to the open sea by a motor launch. The drum was secured to a rope let into the water by a passing ship (Clayton 1968, National Archives of Singapore 1983, Riddell 1986, MacLean 2002). Incoming mail came with beef and vegetables in a barrel dropped overboard. The tin can mail outlived a postal agency that operated from 1933 to 1937, the latter dispatching and collecting mail only three times a year when the official steamer came by (Clayton 1968, Riddell 1986). See Hill (1972) for a detailed postal history to 1946. The Second World War gave the Cocos Islands their career break. On 3 March 1942, their strategic importance as a cable and wireless station was brought home by a Japanese warship which shelled the atoll flattening 24 houses. Thinking they had destroyed the communications installations, they left and never harassed it again. The islands were subsequently erased from Allied maps to protect them (Riddell 1986). After all, this tiny speck of calcium carbonate was all the Allies had in the whole of Japanese-occupied southeast Asia. In mid-1945, as the tide of war began to turn, Cocos became the site of a massive military build-up by the British in preparation for the liberation of southeast Asia. An air base was built, with a steel runway long enough to take heavy bombers, complete with radar, anti-aircraft guns and an air-sea rescue unit. At its height, it hosted 7000 personnel. Indeed, the remote atoll's disproportionate ability to land large aircraft made it one of the speculated touchdown points of flight MH370, a Malaysia Airlines Boeing 777 that vanished in the southern Indian Ocean in 2014. 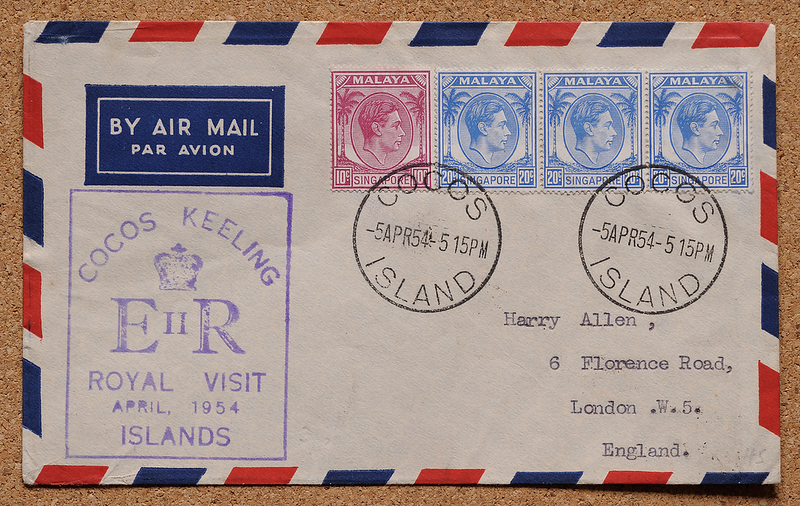 Back in 1952, the postal establishment on the atoll was just starting a new life. 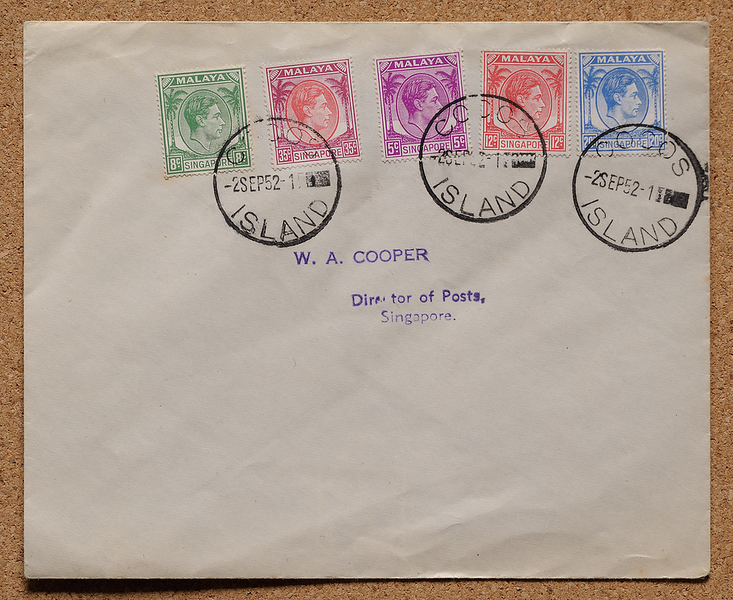 On 2 September (Clayton 1968), after an absence of 15 years, the postal agency reopened with the coconut definitives of Singapore, although coconut definitives postmarked in the Cocos Islands were known since 1946 (see Riddell 1988). Was Cocos Island so special that even the Director of Posts William Cooper couldn't resist a souvenir from the postal agency's opening day? If so, he evidently appreciated the virtues of a simple cover. The author considers it unlikely that an envelope devoid of any formal annotation of government service was made for official record. The postal business was given a boost by Queen Elizabeth II, who dropped by the Cocos Islands on her coronation world tour in 1954. She spent only a couple of hours on the atoll, but it set off a philatelic feeding frenzy. Among the covers produced to mark the occasion was one carrying a violet Qantas cachet (Riddell 1986). The author has encountered five examples, all with the same addressee and envelope design. Another design (not shown) carries a framed portait of the queen, with or without a painting of a half-coconut beside it. A geographical study in red and black. See Riddell (1986) for more about this cover design. The cancellation is executed to philatelic perfection: a clean intersect by the ring without touching the postmark's place and date. The addressee is a well-known philatelist said to have made many cancelled-to-order covers. The pairing of Cocos postmark with Trengganu stamp spans almost the full latitudinal range of the coconut definitive (Kelantan is slightly more northerly). It is a testimony to both the heterogeneity and fraternity of Malaya that the stamps of any state could be used in any other state, Cocos being the extreme case. The islands are geographically significant in another way: the great-circle path from the Cape of Good Hope to the Sunda Strait (the channel between Java and Sumatra) passes through Cocos. Every one of these and other fifth-of-April covers that the author has seen—about 20 so far—has postmarks timed at 5.15pm, and with the same misalignment of numerals: a slightly higher "4" in "54", and an upward-slanting "5 15". As it turns out, these covers weren't postmarked on Cocos at all. 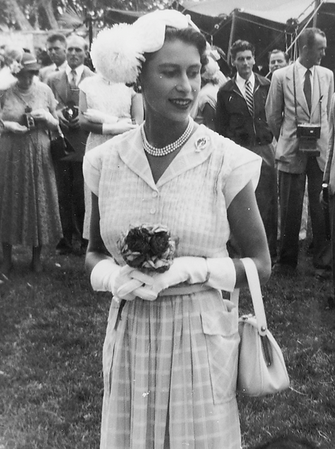 Two letters despatched from Cocos on 2 and 28 April 1954 reveal that all letters posted over the weekend of the Queen's visit were left uncancelled, bundled up onto a Royal Air Force plane, flown to Singapore and postmarked at the General Post Office in bustling Collyer Quay. The government representative on Cocos had arranged this with Singapore's director of posts. The RAF troop-carrier and freighter aircraft—a Handley Page H.P.67 Hastings, a type flown extensively during the Berlin Airlift—took off late at night on 5 April with the bags of mail, which would usually be carried on the regular Qantas flight the day before. On arrival in Singapore the following day, the uncancelled letters were all postmarked 5 APR to match the date of the royal visit. The author sees this as an omen of a culture that would come to dominate the 20th century and beyond: economical mass production to satisfy consumers for whom only appearance really matters. Yet more waves of philatelic tourism were to break over the shores of the Cocos Islands. 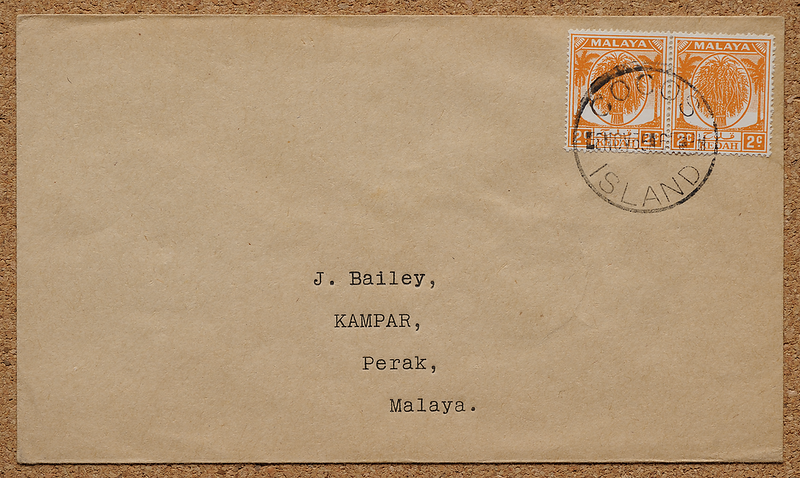 One of the many brown envelopes affixed with coconut definitives of various Malay states and addressed to J. Bailey in Perak where he ran a stamp business with Edward Proud (Joe Robertson comm.). 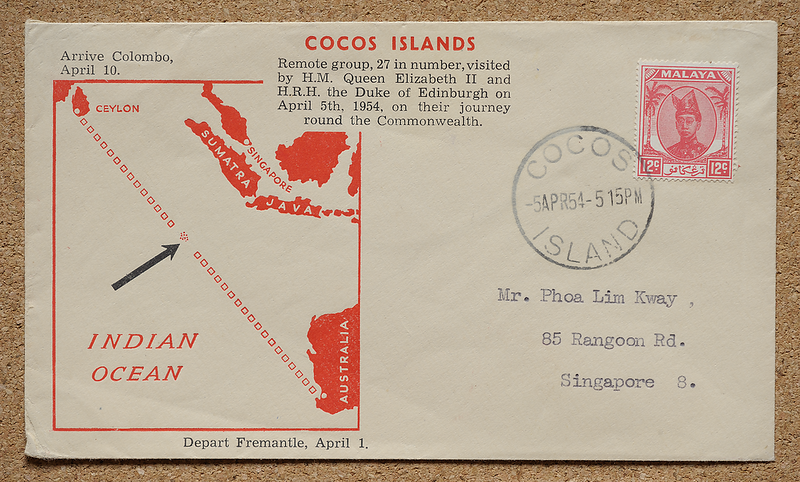 All are dated 8 November 1955, about two weeks before the islands were transferred to Australian jurisdiction on 23 November (see Clayton (1968) and Riddell (1986) for Cocos postal history to this date). The author is not even sure whether they actually went through the post or were simply postmarked and brought back in the luggage, as they are in near-perfect condition. Other than these, the coveted COCOS ISLAND circular date stamp was applied to postal material ranging from unused aerogrammes with no addressee, to a registered envelope emblazoned with the full set of Singapore coconut definitives. Everyday life on the atoll, however, was hardly bothered. The Clunies-Ross family oversaw their fiefdom in an eminently democratic manner, with no police force, giving the islanders a social security possible only without the overpopulation and materialism that was sweeping across the world.